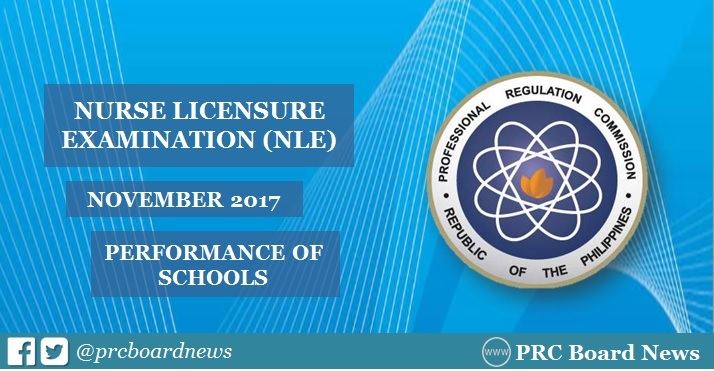 MANILA, Philippines - The Professional Regulation Commission (PRC) recognizes the top performing schools in the November 2017 nurse licensure examination (NLE) or nursing board exam. The result was released on Tuesday, December 12 or in eleven (11) working days after the last day of examinations. University of Santo Tomas (UST) got the highest place in the list of top performing schools, 100% passing rate. PRC administered the nurse licensure exam in Manila, all regional offices nationwide (Baguio, Cagayan De Oro, Cebu, Davao, Iloilo, Legazpi, Lucena, Pagadian, Tacloban, Tuguegarao) and Zamboanga on November 25 and 26, 2017. In the November 2016 NLE, PRC named University of Santo Tomas (UST) and Benguet State University - La Trinidad as the top performing schools with 100% passing rate. In the November 2015 exams, UST, Mariano Marcos State University (MMSU) - Batac and Xavier University (XU) led the schools with 100% passing rate.